KH-8 Dual mode was a modification of the KH-8 Gambit-3 reconnaissance satellite, which was produced in the early 70ies as a fall-back measure against delay of the area surveillance KH-9 Hexagon satellite. It was also called Higherboy or Highboy. KH-8 Dual Mode had the same basic layout as the KH-8 (Block 4) series. The forward part was joint via a roll joint with the Agena-D. The major subsystems of the satellite included a photographic-payload section (PPS), a satellite-control section (SCS), and the booster vehicle. The payload section contained a camera module and two satellite recovery-vehicles (SRV). The control section included the command system, the orbit-adjust module, an attitude-control subsystem, a back-up stabilization system (BUSS), and the power supply. The spacecraft was built, but placed into storage when the KH-9 succeeded. Eventually it was launched on 21. January 1982 on a Titan-3(24)B Agena-D booster into an orbit with a much higher apogee than the KH-8 satellites. It performed area imaging from the initial orbit and later lowered the orbit for high resolution imaging. 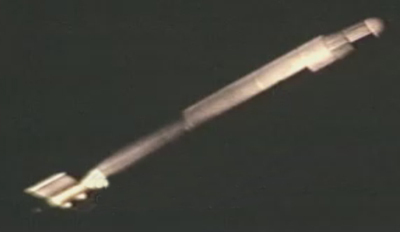 One of the two reentry vehicles failed to return to earth properly. This launch represented a mystery over several years and was mostly attributed to a test flight of the project Indigo radar satellite, which in fact never happened. Four objects from this satellite, originally thought to be subsatellites, were associated with the failed return vehicle, as the internal container separated from the heatshield and thrust cone. The second reentry vehicle returned to earth, but the film was degraded.